World Thrombosis Day is observed in many countries throughout the world on October 13. Its main goal is to raise public awareness of the deadly problem caused by defects in blood coagulation. When a blood vessel is injured, the body uses special blood components, known as platelets or thrombocytes, and fibrin (a fibrous protein) to form a blood clot that prevents blood loss. However, sometimes blood clots form in the body even when a blood vessels is not injured. This condition is known as thrombosis. Thrombosis may occur in veins or in arteries. Venous thrombosis causes congestion of the affected body part, while arterial thrombosis affects the blood supply, resulting in damage of the tissue supplied by the artery. Arterial thrombosis is a common cause of stroke and myocardial infarction. A piece of a blood clot can break off, travel through the blood stream and lodge somewhere else as an embolism. 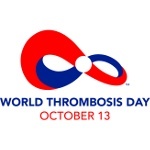 World Thrombosis Day was founded in 2014 by the International Society on Thrombosis and Haemostasis. Its main goal is to disseminate information about thrombosis, including its causes, risk factors, signs and symptoms, prevention, and treatment. The observance is held on October 13 to honor the birth anniversary of Rudolf Virchow, a German physician and pathologist, known for coining the terms embolism and thrombosis, as well as describing the factors contributing to thrombosis. On this day, over 175 organizations around the world hold educational forums, information campaigns, and other events focusing on thrombosis.